92 DEAD IN 24 HRS IN SYRIA, AS THE CHINLESS ONE HAMMERS THE OPPOSITION…….. – The Tundra Tabloids……. 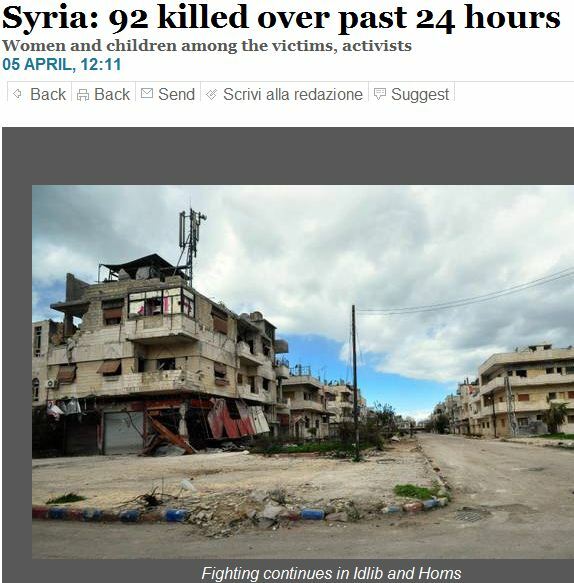 92 DEAD IN 24 HRS IN SYRIA, AS THE CHINLESS ONE HAMMERS THE OPPOSITION……..
As I have been saying all along, Syria is no Libya. They have the Russians in their corner and will not be prone to a NATO fly over, or at least as easily as the former Gadaffi regime was. So Assad will continue to unleash his military, in spasms, in order to throw off the international community while they seek to achieve a final victory. (ANSAmed) – BEIRUT) The identities of 92 people (including women and children) killed by forces loyal to Syrian President Bashar Al-Assad, have been released today by the Local Coordinating Committees Unions of anti-regime activists, who say that yesterday’s casualties were for the most part in the Idlib region (44) and that of Homs (29). The union of committees has reported that 44 people have been killed at Taftanaz, in the north-west region of Idlib, most of whom members of the extended Ghazzal family (known for having taken a stance against the regime). Previous Post Previous Post TOMMY ROBINSON INTERVIEWED AT AARHUS: “WE ARE NOT AFRAID”……. Next Post Next Post OBAMACARE WAS PUSHED IN ILLINOIS BY SENATOR OBAMA AND THE PEOPLE OVERWHELMINGLY REJECTED IT…….